T-Mobile announced "DIGITS" on Wednesday, a new service that lets you check your voicemail, receive calls or view text messages on any device, such as PCs, tablets, wearables and even through the web browser. DIGITS is similar to a service AT&T already offers called "NumberSync" that also allows you to take calls, send messages and more from multiple devices. AT&T NumberSync launched 14 months ago and is free for consumers. DIGITS is free during the beta but won't be forever. DIGITS is available to many more devices, however, and allows multiple phone numbers to work on a single device. It's not limited to just phone calls, either; DIGITS supports files, videos and other features of high-quality messaging options. Like NumberSync, the service works with smartwatches such as the LG Urbane 2nd Edition and Samsung Gear S2/Gear S3. DIGITS is also about consolidation. T-Mobile said customers can also set their devices so that a single one receives calls and messages for multiple numbers. That's perfect if you want to carry one device for work and personal use, instead of carrying two different smartphones. 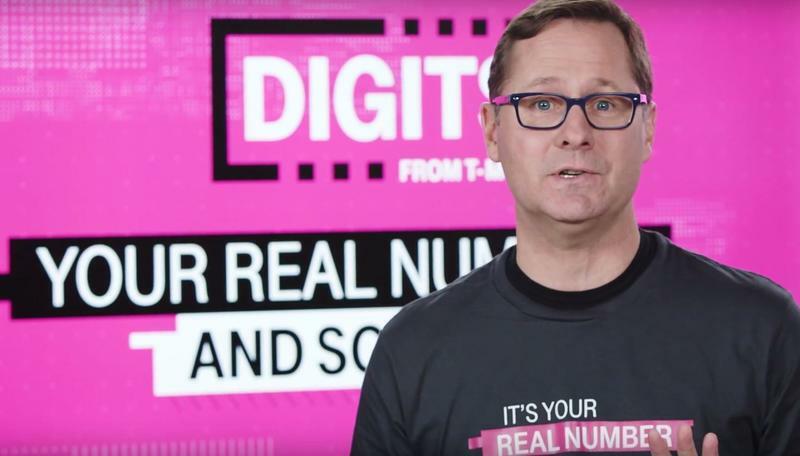 T-Mobile hopes this is attractive to companies that can simply issue new numbers to employees who already have phones, instead of providing them with separate devices or desk phones. T-Mobile said on a conference call that DIGITS will work even if employees carry phones from other carriers such as AT&T, Sprint or Verizon. T-Mobile said this could be compelling for several other use cases, including shared numbers in small businesses or families. Or, perhaps someone wants a temporary number for receiving calls from posts on Craigslist or datings sites, for example, where they might not want to hand out their primary phone number. T-Mobile said DIGITS is already built right into the Galaxy Note 5, Galaxy S6 devices and Galaxy S7 smartphones. Users can swap between their numbers right from the dialer, allowing them to choose which number to use for an outgoing call on the fly. On other devices, including iPhones, users will need to download T-Mobile's DIGITS app. T-Mobile said it doesn't work with iMessage yet so customers are going to need to turn iMessage off if they want messages across multiple devices. DIGITS is only in beta right now and works on iOS 9 or newer, Android 5.0 or newer, Firefox and Chrome on PC/Mac. T-Mobile customers on T-Mobile ONE and Simple Choice accounts can join the beta by heading to the source link below. It's free to partake in the beta, but T-Mobile will eventually charge for the service. It didn't say how much it will cost, only noting that the service "will be attainable from a pricing standpoint."